Size: 7.4" x 3.5" x 0.80"
Casio developed a system called Picture Plot, which allows users to choose from fifty-five different images – such as a water fountain, a clock’s pendulum, or a curved bridge – and plot their graphs over the top of the image to better understand the use of math in the real world. The color display also allows users to link graph colors back to values on the device’s internal spreadsheet – and color-codes brackets to make complicated equations significantly easier to parse at a glance. 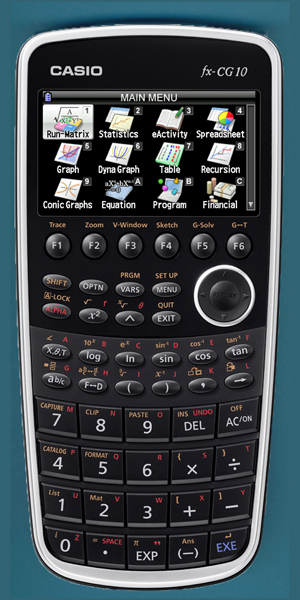 Texas Instruments announced at the 2011 T3 International Conference held on February 25-27 in San Antonio, TX with the TI-Nspire CX and TI-Nspire CX CAS their first graphing calculators with full color, backlit displays supporting even the import of real-world images to view, graph and analyze for example the outline of the path of a basketball.